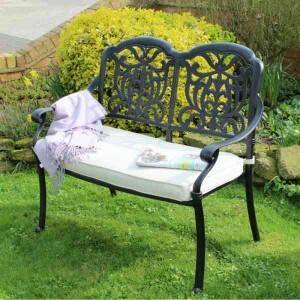 Metal garden benches can be sculpted into beautifully ornate designs or simply act as a frame to support other materials such as textilene that gives a more modern contemporary appearance and Garden Oasis have a selection of both, so that you can pick the best style for your surroundings. Metal benches can be made using either aluminium or steel. Aluminium is lightweight and offers excellent resistance to rust, whereas steel feels more substantial thanks to the heavier weight. Steel benches are usually powder coated to protect against rust but are not completely maintenance free and should be covered when not in use. Aluminium benches can be left outdoors in all weathers, so may be a better choice if you lack space to store your furniture or intend to use it all year round. Whichever bench you choose, home delivery is FREE to most parts of the UK. 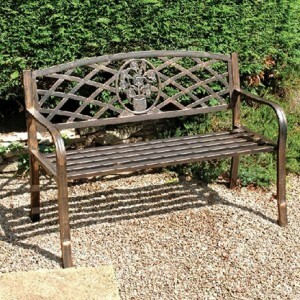 The Cast Aluminium Tudor Bench from Brackenstyle is made using all weather, powder coated aluminium .. 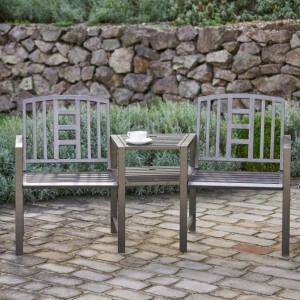 The Hartlebury Companion Seat is an attractive bench for two suitable for any garden. Manufactured b.. The Langley Companion Seat has an elegant design with a scrollwork design on both the arms and th.. 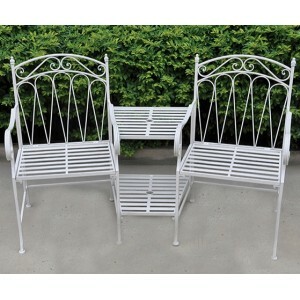 The Romance Antique White Companion Seat by Royalcraft is a delightful piece of garden furniture tha.. The Cupid Seat from Royalcraft's Romance range is a garden bench for lovers. 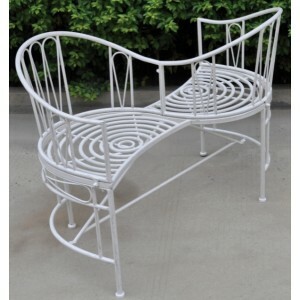 The bench features two ..
Poppy Forge’s Sun Bench offers an affordable yet charmingly designed place for two people to comfort..